The College is committed to fairness and transparency, and this commitment is why we will be posting our decision making tools online. Our Regulatory Impact Assessment (RIA) Statement is our new tool for policy development. 4. Think beyond a regulation-based solution as the default. 1. What is the problem you are trying to solve? Is it about risk of harm? 2. Are the risks you have identified currently managed? 3. Are there any alternatives to regulation that mitigate identified risks? Can the issue be resolved locally? 4. Will the burden imposed by regulation be greater than the benefits of regulation? 5. What regulatory measures are you recommending to introduce? 6. How are you planning to implement and evaluate your proposed policy option? You can see our RIA statement tool by clicking here. This framework guides decision-making regarding Quality Assurance Program (QAP) non-compliance thereby enabling a transparent, consistent and fair process. The tool guides Quality Assurance Committee (QAC) panels in their evaluation of a member’s demonstrated accountability to the QAP. 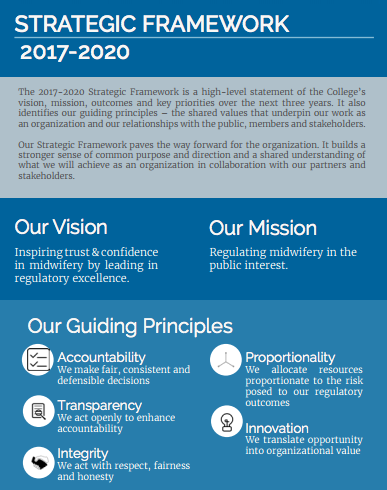 The 2017-2020 Strategic Framework is a high-level statement of the College’s vision, mission, outcomes and key priorities over the next three years. It also identifies our guiding principles – the shared values that underpin our work as an organization and our relationships with the public, members and stakeholders. Our Strategic Framework paves the way forward for the organization. It builds a stronger sense of common purpose and direction and a shared understanding of what we will achieve as an organization in collaboration with our partners and stakeholders. Click here to read our Strategic Framework. 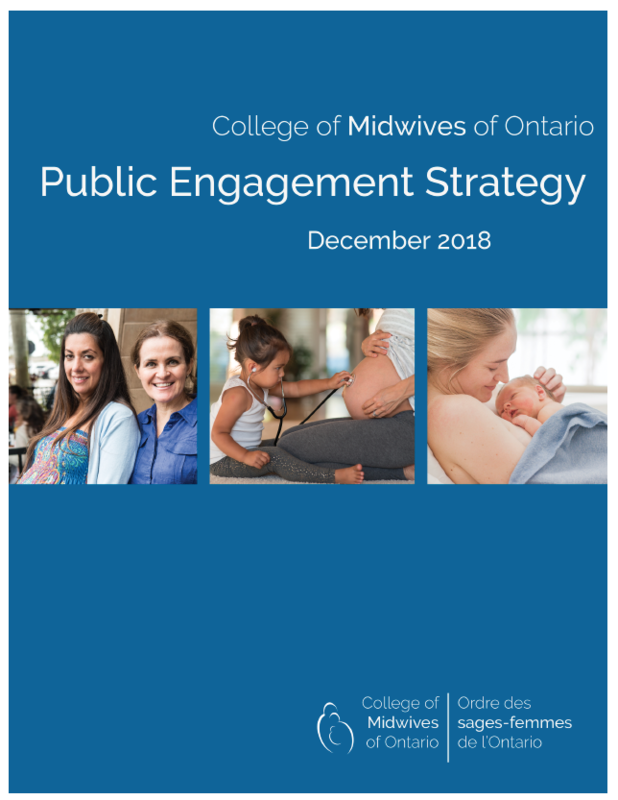 The role of the College of Midwives of Ontario is to set standards of education, training, conduct and performance necessary to ensure that clients receive high quality midwifery care. Our regulatory activities are driven by our duty to act in the public interest, meaning that we put public at the forefront of all of our work. Our mandate and vision reflect this, as does our Strategic Plan and the associated strategic priorities. In our 2017-2020 Strategic Plan (see above), we identified Public Participation & Engagement as one of our strategic priorities. To help us achieve our priorities, and to make sure we are regulating appropriately in the interests of the public and clients of midwifery services, we have developed a strategy around public participation and engagement. This strategy sets out the principles and model we will work to starting from 2018 onwards. The role of the College of Midwives of Ontario is to protect client safety and maintain public confidence in midwifery services. To achieve this, we register qualified midwifery professionals, set professional standards and standards for continuous education and professional development, and investigate complaints and reports about professionals’ competence, conduct and fitness to practise. We cannot effectively fulfil our mandate of regulating in the public interest without thoughtful engagement with stakeholders. We believe that we do better working with others, and that maintaining quality relationships with our stakeholders will enable us to achieve better regulatory outcomes. We recognize the limits of our own statutory powers and responsibilities. Our focus is always on the needs of the clients and the public and by building a comprehensive stakeholder engagement we will ensure that issues are dealt with by the most appropriate organization rather than simply falling outside our remit.